1. High volume collapsing pulse. 3. Jugular venous pressure may be normal or raised. 5. Diastolic thrill may be present. 7. Paradoxic splitting of S2. 9. Ejection click may be present. Loud P2 and left parasternal heave is seen if pulmonary artery hypertension present. High pitched blowing decrescendo early diastolic murmur may be heard at neoaortic area. It may be conducted down the lower left sternal border. Aortic regurgitation produce peripheral signs due to volume overload. 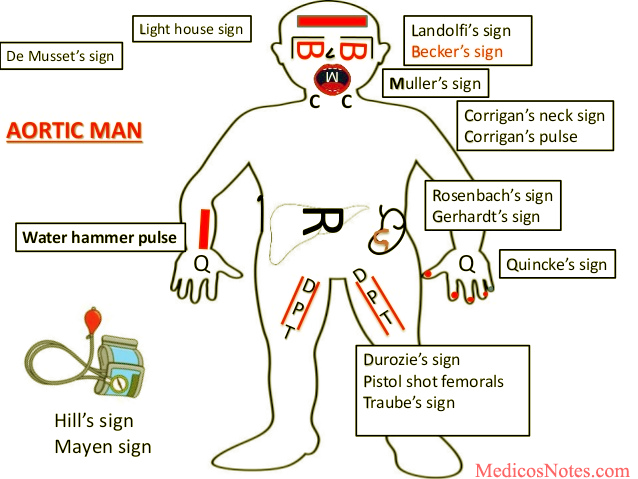 - Collapsing pulse and peripheral signs. - Early diastolic murmur (EDM) in 2nd aortic area. - Mid diastolic murmur (MDM) at mitral area. It is displaced and forceful. Undisplaced and forceful in mild to moderate AR. 2. Diastolic thrill may be present. What are the causes of AR with absent peripheral signs ? - Associated mitral valve disease. It is due to the exaggerated reversal of blood flow in diastole.